Wooooo! It’s Valentine’s Day, and I can help you bring the spice. To your dinner. I’m not trained to help you in terms of spice in other departments. That e-course I took wasn’t through a certifying body, it turns out. Helpful, though. Anyway. Joseph and I picked peppers last September at a local farm that uses organic growing methods. I think they were 10 for a dollar. About 30 of them have been hanging in my kitchen window ever since. They started out green, and my plan was to let them redden and make hot sauce. Five months later, it happened! The folks who took our money at the u-pick stand didn’t know the English name for these peppers, and I don’t speak Russian, but they MIGHT be cayenne peppers, these long, thin, wrinkly guys. 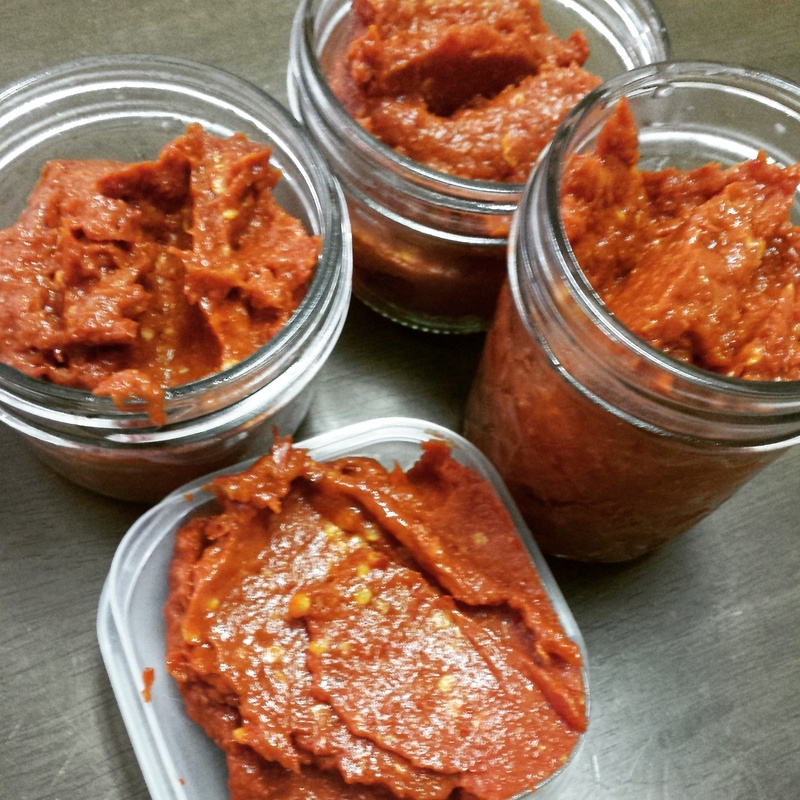 Sriracha is usually made with fresno chiles, but this worked, too. This recipe is good for February, because it isn’t fresh pepper season, so dried is probably the only type you can find that hasn’t traveled hundreds of miles. 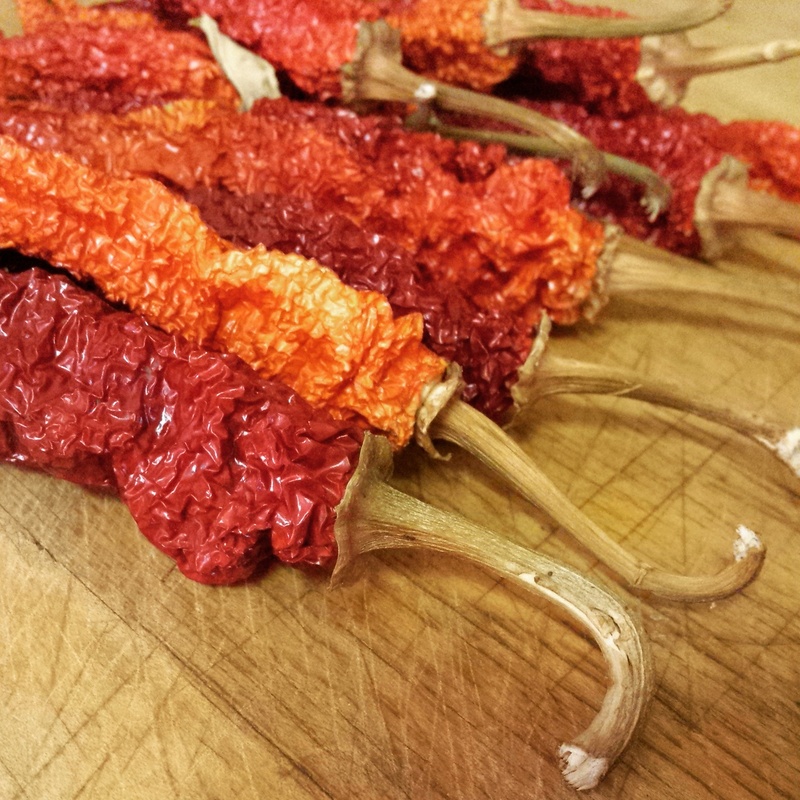 Dried chiles are cheaper, anyway. I set out to just make sriracha, but decided to also try my hand at a bit of sweet chili sauce, with two of the unnamed chiles and two fresnos that I had picked. 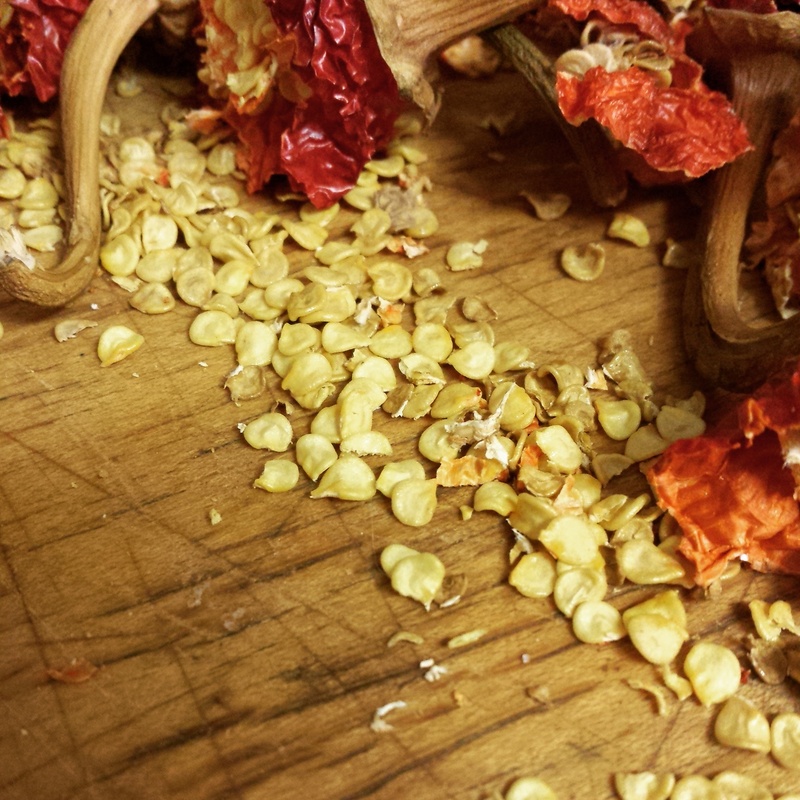 Chop the tops off the peppers and shake out some of the seeds. 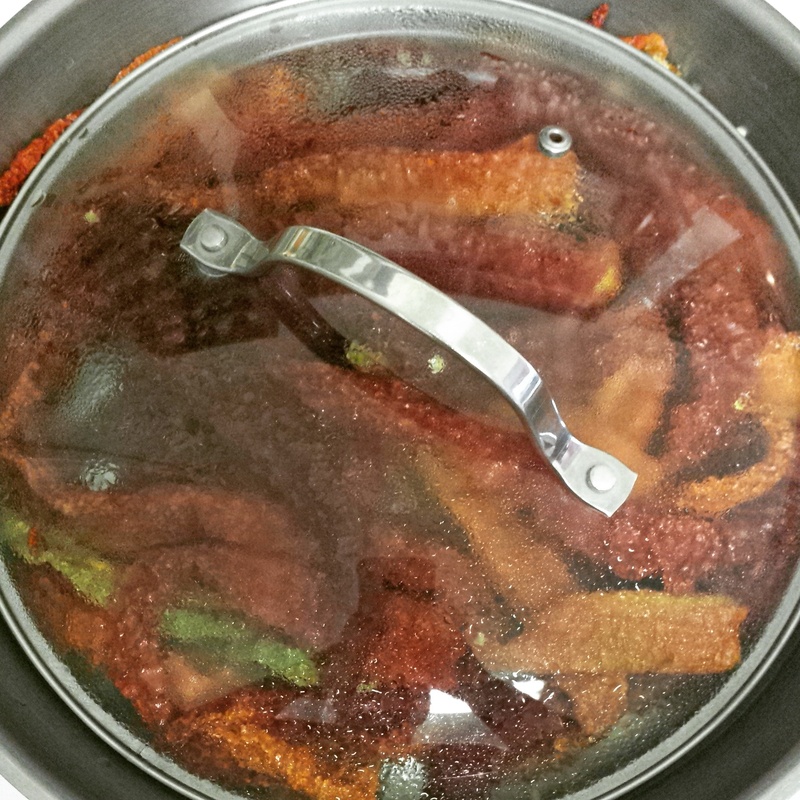 Rehydrate the chiles in a saucepan of boiling water. Simmer for about fifteen minutes, covered. Blend with some other stuff and enjoy. Do the sweet sauce variation, if you wish. Rehydrate the chiles by bringing a large saucepan half full of water to a boil, piling in the peppers, reducing the heat to a lively simmer, and covering them for fifteen minutes, rearranging the peppers as needed to make sure the steam and water and getting to them adequately. 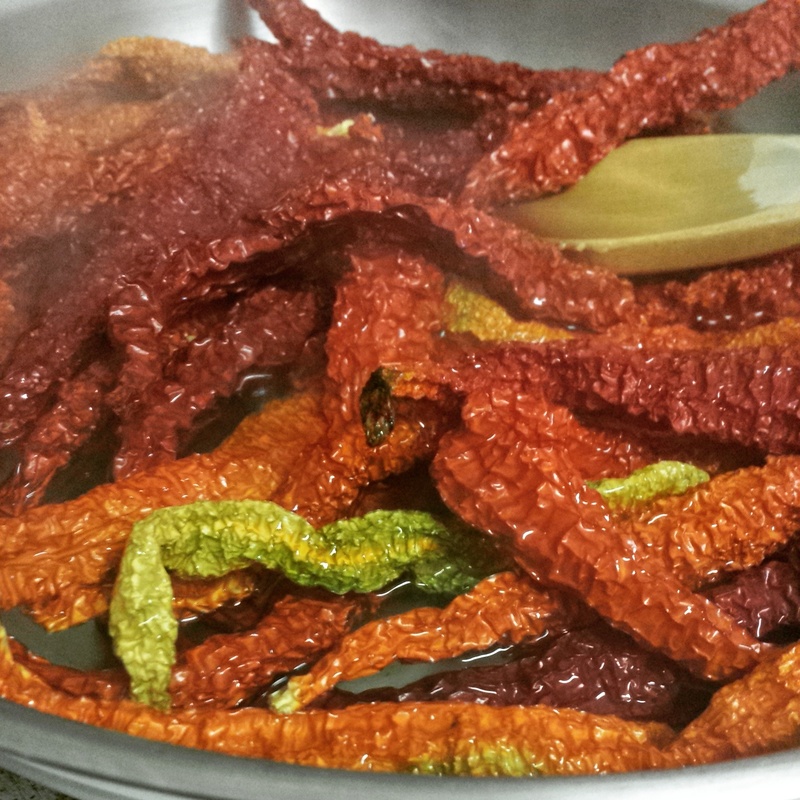 Drain the chiles in a colander, then stick the chiles in a food processor and puree until smooth. Handily, many of the seeds ended up on the sides of the bowl of the processor, and I scraped them right out, because I love spicy foods, but I don’t want to die. Add in remaining ingredients and blend, adjusting to taste. This recipe makes about 2 pints. 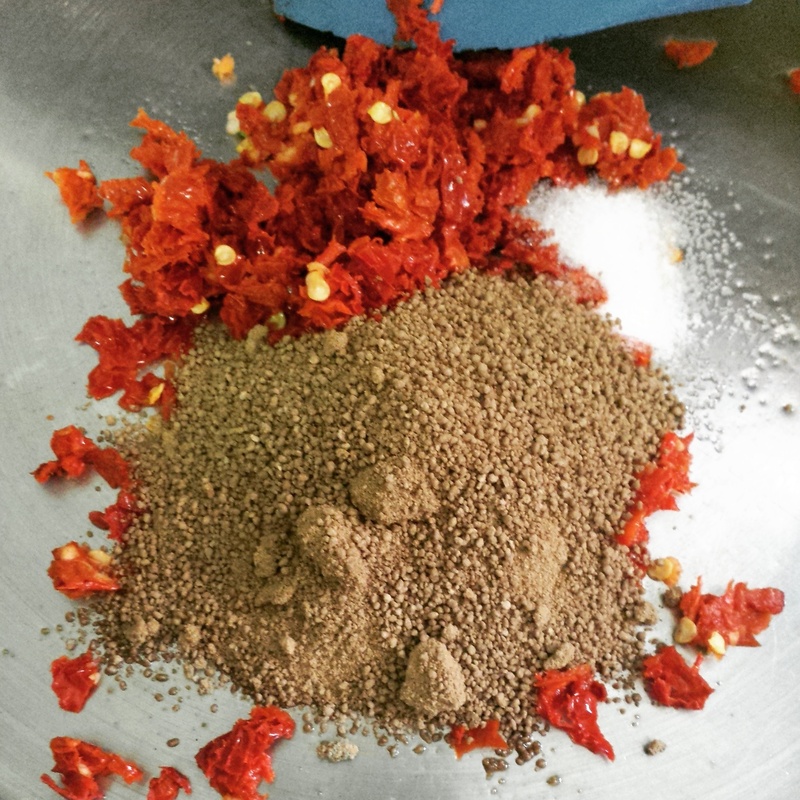 Puree the chiles, scooping or picking out seeds to your desired level of heat. Add in the garlic and puree into a paste. Put this paste in a saucepan, along with the water, vinegar, and sugar. Bring to a boil, then reduce to a simmer. Whisk the starch into the 2 T water, then whisk it into the pan’s contents. Simmer until thickened, then set aside to cool. This recipe makes about a half pint. 14 Feb	This entry was published on February 14, 2015 at 4:40 pm. It’s filed under Collection and tagged DIY, eat local grown, homemade hot sauce, homemade sriracha, homemade sweet chili sauce, hot sauce recipe, organic, organic produce, sriracha, sweet chili sauce, u-pick, valentine's day. Bookmark the permalink. Follow any comments here with the RSS feed for this post. Hi Malerie’s, I really enjoy your info, blogs and all your tips for healthy living. Love reading about the activities and experiments you try. Keep up the good work. Thanks for all your help. Have a wonderful day, Mary (long time friend of your mom and grandmother.